Pt. 1 After just a few years of service, galvanized condensate pans can start to corrode. This creates low spots in the pan causing water to pool, which accelerates the corrosion process, eventually causing the pan to leak. composed of both hydrogen and carbon atoms. Hydrocarbons are said to be “nonpolar,”because they have neither positive nor negative charges. In contrast to that, water is said to be “polar” because it is composed of two hydrogen atoms with partially positive charges, and an oxygen atom with a partially negative charge. Non-polar and polar molecules prefer to remain separate from one another. Therefore, as the saying goes, oil and water don’t mix. In fact, they won’t mix. This preference for separation is so strong that hydrocarbons, like Pancrete, are hydrophobic, meaning that they fear water. Likewise, water is intimidated by a Pancrete-resurfaced condensate pan. The water molecules literally do not want to touch the pan. Eventually, this causes the water to form beads, as it attempts to minimize contact with the Pancrete. These beads quickly produce a sheeting action, causing them to easily drain from the pan. 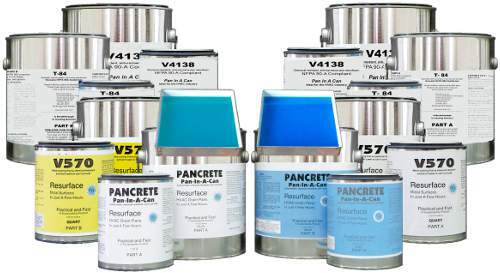 your condensate water push you around, fight back with Pancrete pan resurfacer.